These cabbage-family jewels should go into the ground in early May. 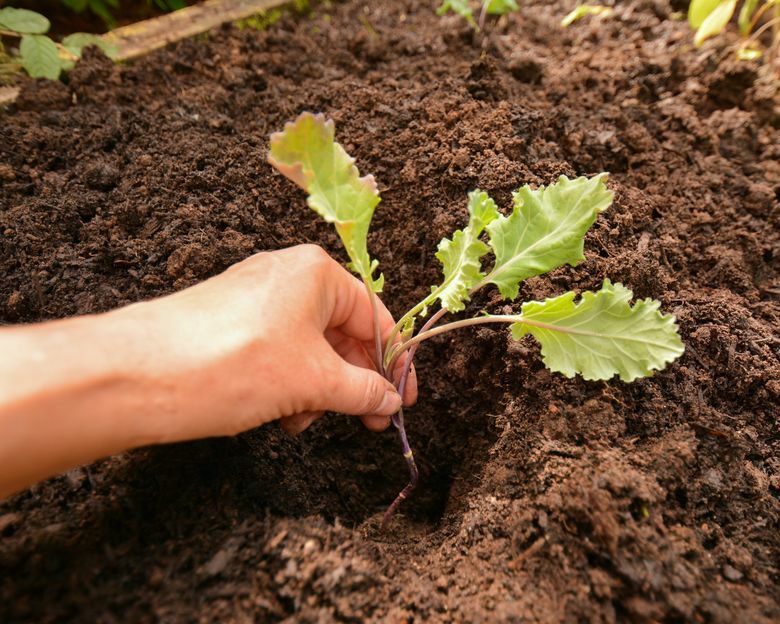 EARLY MAY IS a great time to plant cabbage-family vegetables such as kohlrabi, broccoli and Brussels sprouts, and most nurseries have a great selection of starts ready for planting. One of my favorites is kohlrabi. The German name means “cabbage-turnip,” and it forms an edible aboveground bulb with delicate flavor and crunchy texture. It’s equally delicious raw on salads or cooked in stir-fries. Plant the starts about 6 inches apart. As is true of all cabbage-family plants, kohlrabi performs best in rich, well-fertilized soils with a pH of 6.5 to 7 (slightly acidic but almost neutral). If you didn’t apply lime in the fall, work a handful of organic bone meal and a half-cup of organic vegetable food into each planting hole. 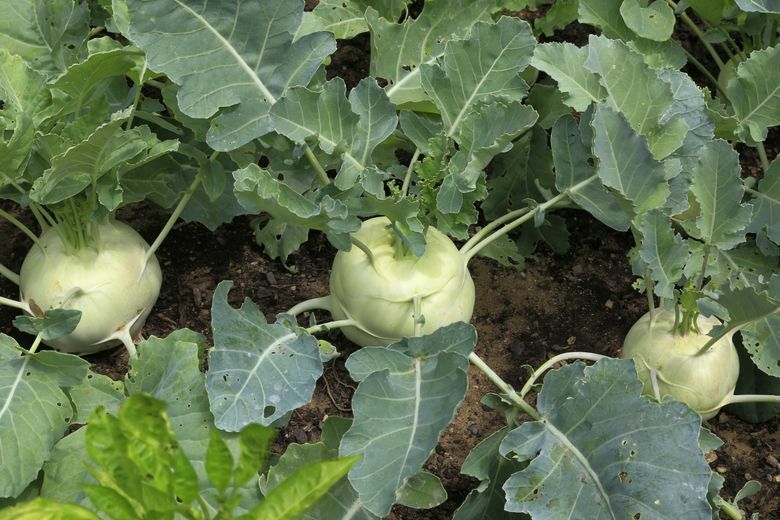 For tender, sweet flavor, harvest kohlrabi when the bulbs are less than 2 inches in diameter. If they’re allowed to grow bigger, the texture can become woody. The record for the biggest kohlrabi bulb grown in Washington is 29 pounds, but I recommend checking with your dentist before biting in to a honker like that! Broccoli is an Italian word meaning “little arms,” but this delicious vegetable should have been named “big muscles,” because it is filled with nutrients and is high in vitamins A and D. It’s also one of the easiest veggies to grow. Plant the starts about 18 inches apart, and keep the soil evenly moist. Drought-stressed broccoli produces rough-textured heads. Harvest when the florets are still tight, cutting the stem at a 45-degree angle. 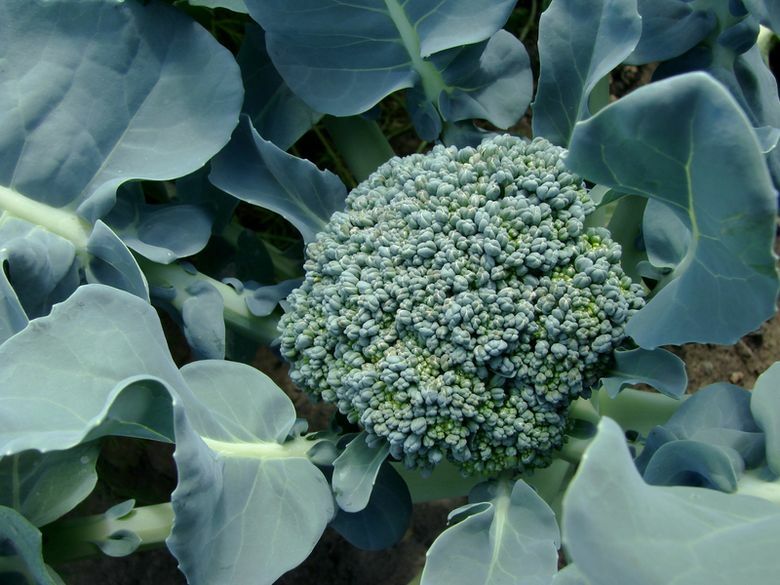 As long as you keep harvesting the side shoots regularly, your broccoli plant will keep pumping out delicious florets for weeks. Eat lots of it, and whenever possible, wear muscle shirts to show off your bulging biceps in public. 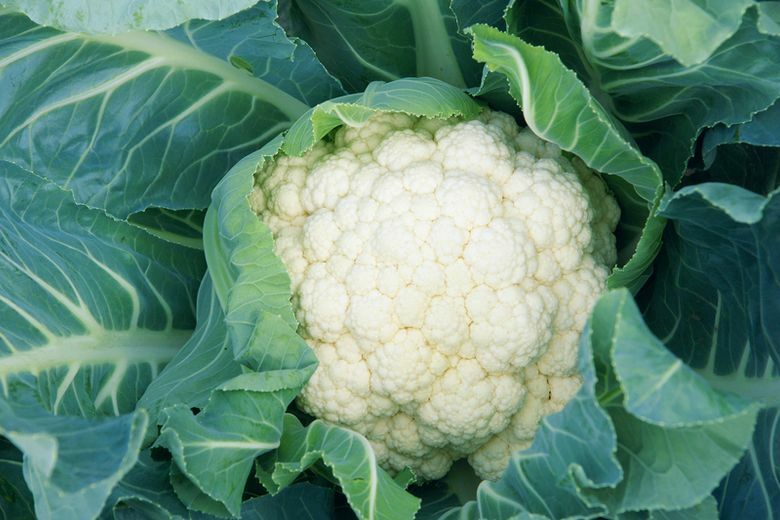 Mark Twain once wrote: “A cauliflower is nothing but a cabbage with a college education.” This descendant of wild cabbage definitely graduated with top honors. It’s highly nutritious, low in calories and loaded to the brim with antioxidants. Best of all, it’s delicious, and easy to grow. Plant starts as soon as possible. Cauliflower prefers cool, moist growing conditions. If stressed by unseasonably hot weather, it will form small heads, or bolt and go to seed. Be prepared to water and even shade the plants if unseasonably warm temperatures occur. 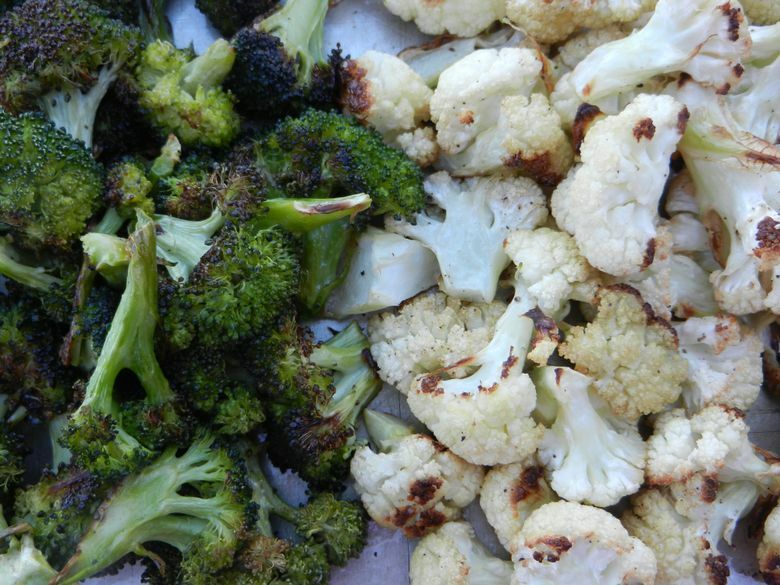 Sun can discolor cauliflower heads, so grow self-blanching varieties or, if the leaves aren’t sheltering the head by the time it’s the size of an egg, gather up the longest leaves, wrap them over the head and secure them with a rubber band. Harvest when the heads are good-sized, before the florets begin to separate. Finally, why is it that in almost every couple, one person loves Brussels sprouts, while the other detests them? I suspect many boomers are turned off by memories of growing up with moms like mine, who, for some unknown reason, believed you had to boil the living tweedle out of them to make sure they were safe to eat. Unfortunately, overboiling Brussels sprouts brings out the stinky odor of glucosinolate sinigrinan, an organic compound that contains sulfur. You’ll gain a new appreciation of these little love nibbles if you wait to harvest until temperatures turn cold. 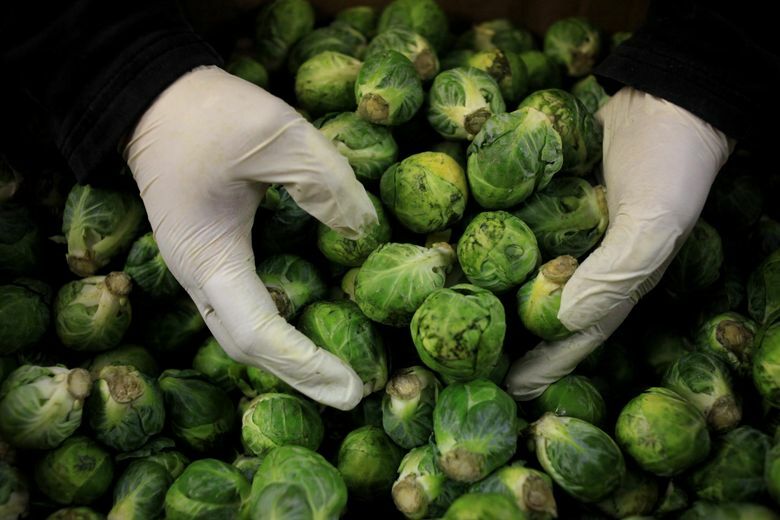 The sprouts can easily withstand light frosts, and the cold makes them taste sweet as sugar. Rather than boil them, as my mom did, cut the sprouts in half; drizzle with olive oil; sprinkle with garlic, pepper and salt; and roast on the grill. Plant starts 24 inches apart, as soon as possible. 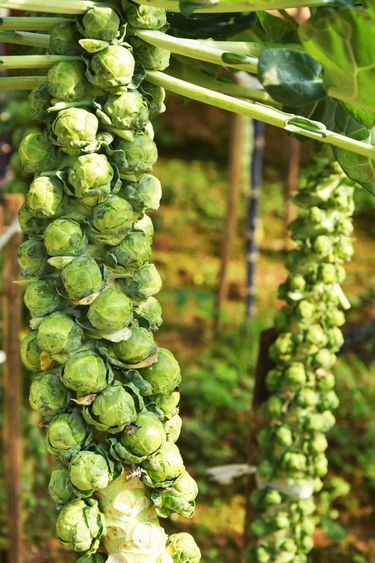 Brussels sprouts don’t tend to set sprouts well once the weather turns hot and dry. The worst thing about growing Brussels sprouts is that huge populations of aphids often find their way into them. Prevent this by washing the aphids off with a daily blast of water from the hose nozzle during the period when sprouts are forming. Take it from one who knows: Accidentally serving “extra-high-protein” Brussels sprouts to your sprout-challenged spouse will not create a convert.